Sign up for Broadjam today to follow Dave Sadler, and be notified when they upload new stuff or update their news! Guitar driven...blues inspired..."Fade to Blue", a 16 track, full-length CD by Dave Sadler, is now available from BluezArt Records. On "Fade to Blue" you will find a variety of guitar driven, blues inspired tracks ranging from Chicago, Texas, and traditional Delta influenced tunes, to blues/rock/jazz fusion, and reggae numbers. Working with accomplished studio musicians from across the U.S. and the U.K., Dave Sadler has compiled a collection of music that draws from the blues/rock heritage of the nation's mid-section. From the farmland Delta of South Arkansas, Mississippi, and Louisiana to the streets of Chicago and the plains of Texas, the early Blues greats paved the way for modern rock, and paid their dues. The music on "Fade to Blue" is intended to be an acknowledgment of their struggles and contributions, with a few messages for our times. Collaborating with Dave on several tracks for the Fade to Blue CD is Dan Cipriano, the busiest saxophone player in New York. Dan has performed, or recorded with Wilson Pickett, Bruce Springsteen, The Allman Brothers, Gary U.S. Bonds, Michael Bolton, Southside Johnny, George Thorogood, Paul Shaffer, and a host of others. You will love his contribution on Fade to Blue. The new solo CD, FADE TO BLUE, is now available from BluezArt Records and CDBaby.com. 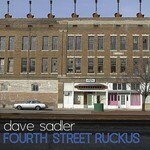 Visit www.davesadlermusic.com for additional information. MP3 downloads are also available through iTunes and Amazon.com downloads. Dave is affiliated with BMI as a songwriter/composer.